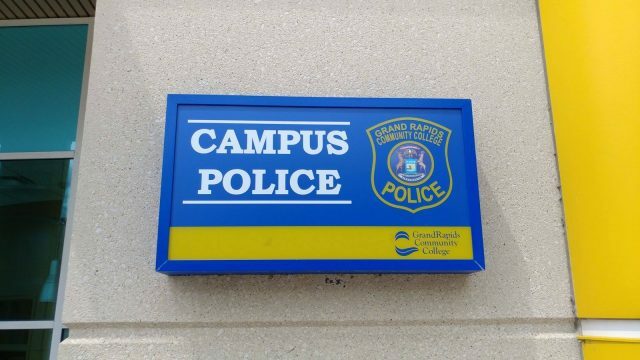 On Nov. 10 at approximately 1:06 p.m., a Grand Rapids Community College student called the GRCC police department to report that she was hit by a car in the Lyon parking ramp. The student said that at approximately 12:34 p.m., she was walking to her vehicle which was parked on level four of the Lyon St. parking ramp. She said that she was near the elevator and that there were two vehicles coming from different directions and they that they both stopped to see who would go first. She said that after a few seconds of neither of the vehicles moving she decided to walk in front of one. As she started walking the female driver of the vehicle started moving too and hit her on her right knee. She said the vehicle was not moving that fast but she did fall over the front of the car and caught herself with her right hand on the hood of the car. She said that she looked at the driver and she continued to walk and the driver did not stop and left the parking lot. She said that the second vehicle was a grey BMW with a male driver. The woman said that the male driver looked at her and gave her the thumbs up to see if she was okay. The woman said that she was and gave him the motion that she was and he left the area as well. The women compared the incident to a 4-way stop, where everyone was looking at each other to wait for someone to go. She felt like the incident was an accident. However, she said that the female looked at her and kept driving. The officer asked if she had an injuries and she replied that she had some light bruising on her right knee. The officer asked if she was having any pain in her hands and said that she was not. The officer also asked her if she was going to seek medical attention and she said that she was not. The officer asked her if she was able to get the plate numbers from the vehicle that hit her and she said that she did not. She described the vehicle to the officer as a dark colored, possible black SUV crossover or Hyundai. The woman said that she would be on campus Monday for class. The officer asked her to stop into the police department if she had any more swelling/discoloration to her knee so the officer could take a picture for evidence. The officer reviewed the footage from the camera and at 12:34 p.m a black Hyundai Sante Fe exit the parking ramp, followed by a grey BMW at 12:35 p.m. The officer was able to figure out the plate number and was able to locate the name and the GRCC student. The officer left her a message referring to the incident and asked her to call them. She said the woman continued walking and looked at her through her side window. The women said the she felt bad and should have stopped to talk to her. She said that when the pedestrian continued walking she was a bit confused and thought that she was okay. The women explained that it was her responsibility to stop and talk to someone if she hit them. The officer told her that the pedestrian reported some minor pain in her knee but was not going to seek further medical attention. The officer told her that the report was closed at that time and the they would contact her for anything further. On Nov. 11 at approximately 7:21 a.m., a Grand Rapids Community College police officer was dispatched to the Ford Fieldhouse about a trespassing complaint. The caller stated that a homeless man was walking into a building as they opened it up and sat down in the entryway. Two police officers responded and made contact with the man, who was sitting against the wall inside the front doors. One of the officers asked him what he was doing there and the man replied that he just needed to warm up for a minute. The officer asked him if he had a form of I.D. on him and the man replied that he did not. The man gave his name verbally to the officers and one of the officers recognized his name and it was in the GRCC PD system. The officers gave dispatch the man’s name and asked them to check it. Dispatch advised that that the man had a local warrant for his arrest for failure to appear at 61st District Court with the original charges of consuming alcohol in public. The officer told the man that he was going to place him under arrest for the warrant. The officer helped him stand and handcuffed him behind his back. The officers escorted the man back to the police department and brought him to an interview room for questioning and to confirm the warrant.